This discovery is bittersweet. Have you ever had one of those moments when you think you've discovered something truly unique? You know, one of those instances when you look at your discovery and think, "Wow! This is... I've got to go tell people about this immediately!" No? Am I the only one? Well, here's my latest ego-crushing reality-two-by-four-to-the-face moment. Based on the picture above I think you can see where this is headed. There I was, leaning against the kitchen counter, minding my own business, when I spied some things on the same counter that *gasp* my daughters were supposed to have put away. I saw the blender base and a nearby canning jar. Being keenly in touch with the MacGyver side of my personality, I looked at them and, with an almost Terminator-like scan, I thought, "Oh yeah, those two things were clearly made for each other!" 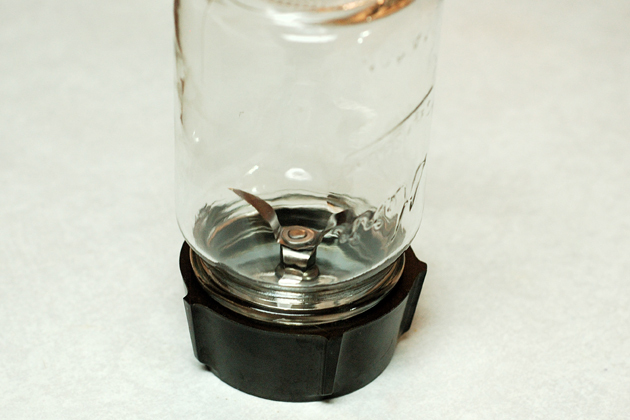 With great expectation I grabbed the jar and quickly mated it to the blender base. As I screwed them together I was already thinking about the possibilities of my discovery. I could make personal milkshakes (more on that later), small batches of marinades or sauces, homemade mayonnaise, salad dressings, the list was almost endless. Eager to share what was sure to be an earth-shattering culinary discovery, I showed our youngest daughter, Chloe. She was amazed, as she should have been. The moment that I mentioned the possibility of personalized milkshakes, with a built-in serving glass, her eyes lit up and I could tell that she got it. Within moments she had me convinced that we must make milkshakes immediately to test this new-found awesomeness. Sandi was out and about with the older two girls, so I called her and asked her to get some ice cream sandwiches on the way home. She did, and the three girls enjoyed ice cream sandwich shakes. It worked flawlessly. Today, as I was thinking about how cool this post would be, I did something that would quickly bring me a strong dose of reality. I Googled "blender mason jar" (without the quotes). 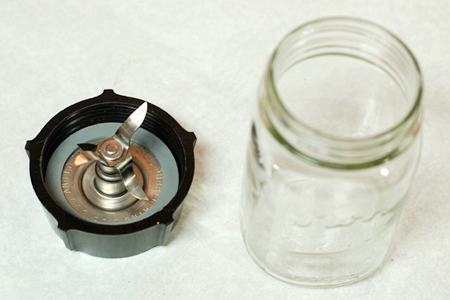 I was shocked when I found that apparently everyone but me knew that small mouth canning jars fit the average household blender base. Although my ego was bruised, I held out some hope that some of you, my beloved readers, would find this discovery to be as exciting as I initially did. Note: The milkshake idea was inspired by an online interview with Guy "The Human Lava Lamp" Fieri where he described some dude doing apple pie shakes by dumping a whole pie, crust and all, in a blender with ice cream. I made mine with just a standard cheapo ice cream sandwich and a little whipping cream and whole milk. Chloe said, "This is the best shake that I've ever had." Everybody but ME and you knew about this. Thanks for this post, nice little bit of news. How does one get the mason jar off of the blender without losing contents? I have one of those and it is news to me too. But mine came with 2 main jars and 4 drink mugs that I can use for the same purposes, so I haven't needed an extra jar yet. But making a butch of small batches for gifts, that is an idea. Well WOW!! I didn't know about this either, but sure glad i do now!! Don't feel bad if you haven't heard of this before because that means you bought a quality blender and hadn't broken the pitcher that came with it.